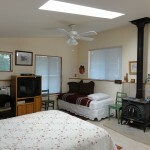 The Guest House features a queen-size bed, a twin-size bed, table and chairs, Direct TV, a kitchenette and private bathroom with shower. 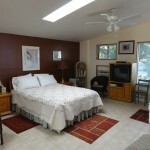 B&B Price: The Guest House is $95 per night with a continental breakfast. 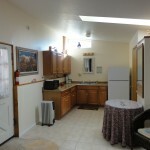 MONTHLY RATES: These are ‘no frills’ rates and do not include breakfast: $95o month includes all utilities, wifi. Laundry room on premises for month to month guests only.